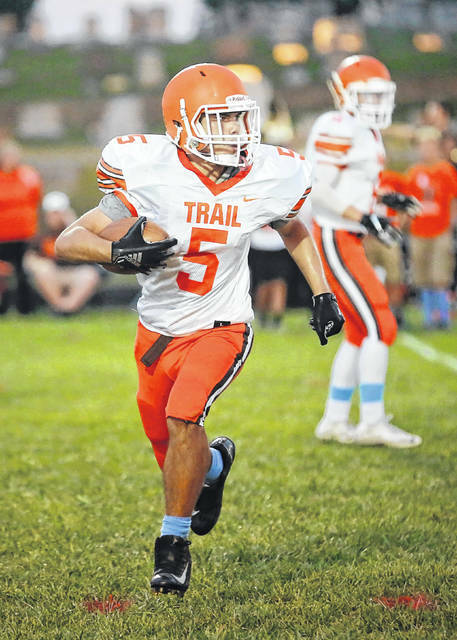 National Trail’s Joe Lawson helped lead the Blazers to a 45-8 win over Tri-Village on Friday, Sept. 21. With the win, Trail improved to 3-2 on the season. 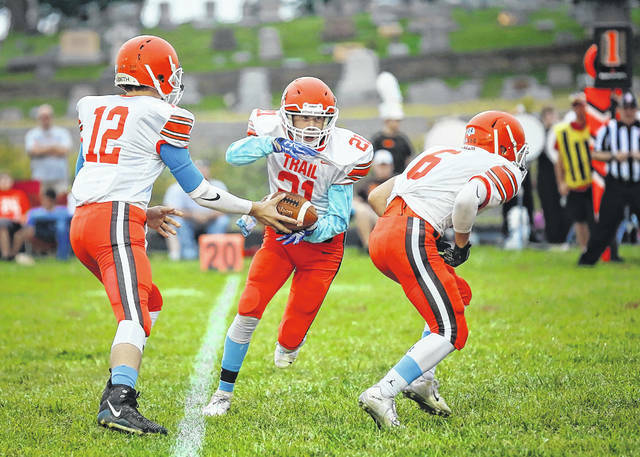 NEW MADISON — National Trail’s football team bounced back from a disappointing overtime loss last week and the loss of a classmate earlier in the week to pick up its third win of the season. 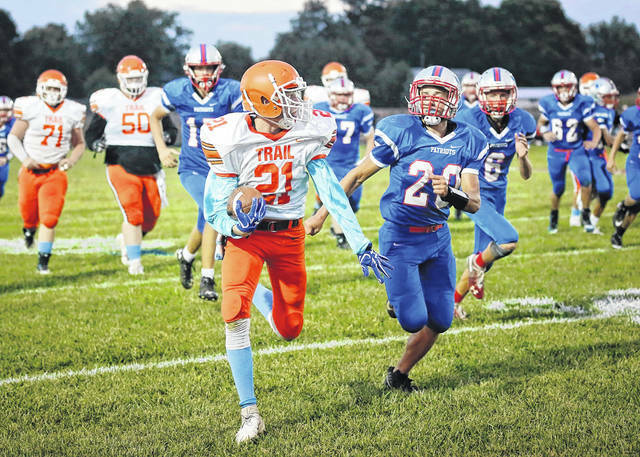 The Blazers jumped out to an early lead and never looked back in handing host Tri-Village a 45-8 loss, on homecoming night, on Friday, Sept. 21. Trail took the opening drive all the way down the field, but the Patriots defense stiffened and a corner pass into the end zone was batted away forcing the Blazers to kick a 32-yard field goal and to go up 3-0. Things didn’t start well for the Patriots on offense when they bobbled the kick-off and was downed on the 2-yard line. After escaping a near safety on their first possession they would punt from the back of the end zone setting up Trail on the 30-yard line. 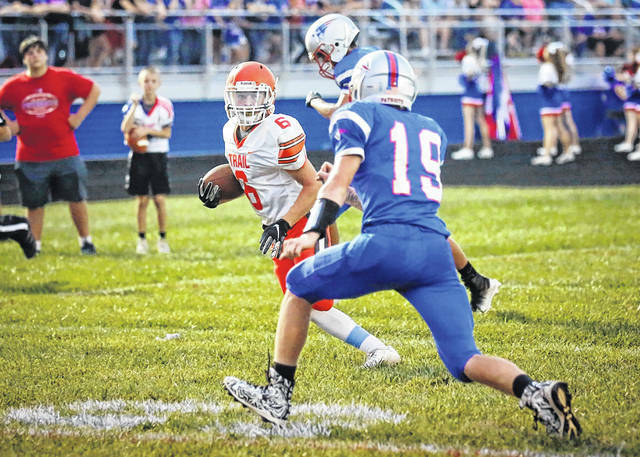 Tri-Village gained a little momentum stopping the Blazers on a fourth-and-3 to take over on downs and thwart a good scoring opportunity. But the Patriots gave the ball right back to National Trail and this time the Blazers would score a touchdown on a fluke play with Peyton Lane picking up the loose ball and scampering into the end zone. The two-point conversion put the Blazers up 11-0 with 1:09 to go in the first quarter. The Patriots put together a nice drive moving the football into the red zone looking to respond, but a pass by Layne Sarver was picked off by Joe Lawson at the 17-yard line to thwart a scoring attempt. A few plays later, Evynn Short rewarded Lawson with a 5-yard pass for the score and the Blazers were in command, leading 17-0. Lane added another score in the first half for NT on a 2-yard run and the Blazers led 23-0 at the half. 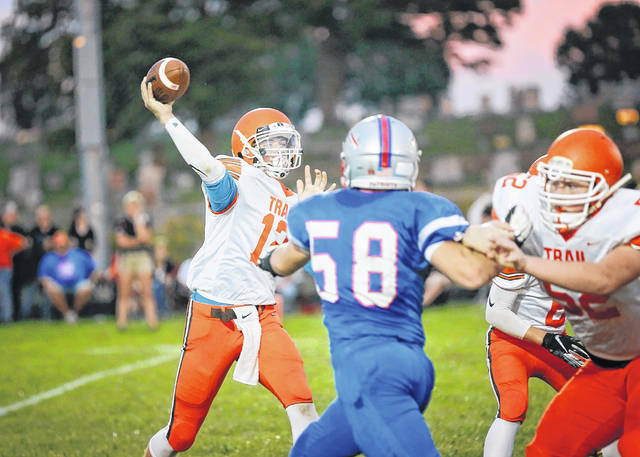 Tri-Village had some opportunities in the third quarter but just couldn’t finish. They had three possessions in the third quarter, punted once, fumbled once and was intercepted once. With the Blazers leading 38-0, Cody Eyer intercepted a short pass at midfield and returned it to the 33-yard line. Derek Eyer then finally got the Patriots on the scoreboard on a 26-yard TD run up the middle. Quarterback Layne Sarver then dove for the corner pylon for the two-point conversion to make the score 38-8 to avoid the shutout. National Trail moved the football all the way down the field and with 16 seconds left to play punched in one more touchdown to make the final score 45-8. With the win, Trail improves to 3-2 overall and 1-2 in the Cross County Conference. The Blazers return home Friday, Sept. 28 to host Tri-County North. This entry was tagged CCC, Evynn Short, Joe Lawson, National Trail Blazers, Peyton Lane, Tri-Village Patriots. Bookmark the permalink.